The articulation afforded the hand by the wrist is important for mobility, strength, and dexterity. The pain produced by arthropathy of the wrist causes the patient to use a wrist splint to decrease pain. However, loss of mobility due to splinting is only part of the problem. The pull of the finger and wrist flexors and extensors exerts considerable force on the many intercarpal joints. Pain produced by bone-on-bone contact is compounded by the pressure exerted in active motion, and the result is reluctance of the patient to perform active motion. Joint arthropathy resulting in wrist arthritis is nearly identical to arthropathy in other joints, including the hip and knee. The principal problem is loss of articular cartilage between the carpal bones and/or the metacarpal and distal radius. The major difference is the fact that the wrist is not normally a weightbearing joint. Wrist arthrodesis is also indicated for stabilization of the wrist when combined with tendon transfers, for correction of wrist deformities in patients with spastic hemiplegia, and for salvage of unsuccessful wrist arthroplasty. Bone-on-bone contact produces reactive bone formation in the subchondral area and eventually results in eburnation (sclerosis) of the contacting bone surfaces. Pressure and abrasion irritate afferent nerves in the substance of the bone. Inflammation is either a result of the primary etiology (eg, rheumatoid arthritis or gout) or can be a result of synovial irritation. Prostaglandins and cytokines are generated as a result of inflammation, causing pain and decreased mobility of the wrist. No comprehensive epidemiology data for wrist arthropathy are reported in the literature. However, Watson and Ballet reviewed 4000 wrist radiographs for evidence of arthritis (eg, joint space narrowing, osteophyte formation, subchondral reactive bone formation, or subchondral cyst formation). Of these 4000 radiographs, 210 (5.3%) had unequivocal radiographic changes consistent with wrist arthritis. The scapholunate advanced collapse (SLAC) pattern was most prevalent, noted in 120 (57% of pathologic joints) of the 210 radiographs. In this study, triscaphoid arthritis (ie, scaphoid, trapezoid, and trapezium) was found in 14% of affected wrists. Non-scaphoid-related arthritis was found in only 3% of affected wrists. The radiolunate joint was almost never affected. Note that this population did not include wrist arthritis due to inflammatory arthropathy. The goal of arthrodesis for painful arthritis is to prevent motion by obtaining bony consolidation of worn joint surfaces and thereby remove the pain generated in the joint. In addition, wrist arthrodesis can be beneficial in providing a more functional hand and upper extremity in patients with deforming spastic hemiplegia. The earliest wrist arthrodesis procedures consisted of decortication and combinations of corticocancellous bone grafts keyed into accurately cut slots and keyways. Immobilization of the wrist was required postoperatively to ensure adequate healing. Total wrist fusion still represents the main treatment for severe posttraumatic disorders of the wrist due to long-standing scaphoid nonunion advanced collapse (SNAC), SLAC (see the images below), and occasionally posttraumatic arthritis secondary to distal radius fractures. Wrist arthrodesis. Stage III scapholunate advanced collapse (SLAC) wrist. Patient desired motion-preserving procedure. Wrist arthrodesis. Sequence of degenerative changes in scapholunate advanced collapse (SLAC) wrist arthritis pattern. Subtotal arthrodesis is not recommended for patients with rheumatoid wrist joints or those engaged in hard manual labor, because the functional results are only negligibly better than those obtained with total arthrodesis. Limited wrist arthrodesis is the surgical fusion of selected bones of the wrist. In each case, the extent of the fusion is determined by the extent of the disease process. A contraindication for wrist arthrodesis is an open distal radial physis. Severe trauma to the wrist and physis might require epiphysiodesis and, therefore, allow for fusion. A relative contraindication is an elderly patient with a sedentary lifestyle, especially if the targeted wrist is the nondominant wrist. In this situation, an arthroplasty may be more suitable. One surgical treatment not involving arthrodesis is particularly useful in the SLAC wrist. The treatment involves partial denervation of the wrist through division of the anterior and posterior interosseous nerves at the level of the wrist through a small dorsal incision, as described by Berger. This does not affect the articular changes directly but can reduce symptoms to allow arthrodesis to be postponed or avoided. The surgical technique depends mainly on the quality of bone substance and degree of joint degeneration. Differences between fusion types include the type of bone graft and osteosynthesis being used. The aim is to create a stable joint in an acceptable functional position. The position of arthrodesis depends on the patient's needs. A neutral position is generally accepted in patients with rheumatoid arthritis, whereas slight wrist extension and ulnar deviation are preferred in patients with degenerative joint disease. [16, 17, 18, 19] A stable osteosynthesis with plate fixation is reliable and allows early rehabilitation. The use of internal fixation has decreased the need for prolonged immobilization in a cast postoperatively and has improved outcomes. Historically, single or multiple screws have been used to hold a cortical bone graft in place in the dorsal aspect of the wrist. The use of a single K-wire to supplement immobilization in a cast has also been described. A technique described for use in patients with rheumatoid arthritis uses a single permanent Steinmann pin advanced retrograde from the third metacarpal into the medullary canal of the radius. A later modification of this method was the addition of a Rush rod with supplementary staple fixation, eliminating the need for postoperative immobilization in a cast. In fact, the results of a modification of this technique reported by Millender and Nalebuff support the finding that immobilization in a plaster cast is not imperative after wrist arthrodesis in patients with rheumatoid arthritis when internal fixation is used. This technique has also been used for arthrodesis of wrists in individuals with posttraumatic disorders. Other methods of internal fixation included the use of multiple staples without an intramedullary pin and the technique of placing a pin from the thenar eminence into the medullary canal of the radius without exposing the wrist. The use of dorsal placement of a nine-hole plate from the second metacarpal to the radius with an additional corticocancellous autogenous iliac crest bone graft was first described in 1972. Later, Larsson described a similar technique that used a six-hole self-compressing plate. By the early 1980s, a larger eight-hole 3.5-mm dynamic compression plate was advocated to provide more appropriate rigid fixation. Currently, a specifically designed wrist arthrodesis plate is available, which combines a 3.5-mm dynamic compression plate proximally and a 2.7-mm dynamic compression plate distally. (See Technique.) This combination AO/ASIF (Arbeitsgemeinschaft für Osteosynthesefragen/Association for the Study of Internal Fixation) wrist arthrodesis plate allows improved and stable fixation by using larger screws in the distal radius and reduces the risk of metacarpal fracture and fragmentation by using smaller 2.7-mm screws into the metacarpal. Application of this wrist fusion plate yields a high rate of fusion when bone graft is used and, in comparison to other wrist arthrodesis techniques, yields a more predictable rate of fusion. Three versions of the AO/ASIF wrist fusion plate are available: short carpal bend, long carpal bend, and straight plate. All versions use three 2.7-mm metacarpal screws, one 2.7-mm capitate screw, and four 3.5-mm radius screws. The use of corticocancellous bone graft from the iliac crest is still advocated to augment the site of the arthrodesis for appropriate osseous consolidation. Slot grafts and onlay grafts create the added physical integrity of corticocancellous grafts. However, data have been reported showing that cancellous bone alone is sufficient for fusion when used with fixation. This has facilitated harvesting cancellous bone from the distal radius, eliminating the need for iliac crest bone graft harvest when limited amounts of graft are needed. Limited intercarpal arthrodesis can be achieved by either onlay corticocancellous grafts or interpositional cancellous grafts performed through a dorsal exposure. In an attempt to preserve motion, various limited arthrodeses of the carpus have been described. Although these procedures are technically demanding, successful results may be expected, especially in conditions of carpal instability. The decision as to which carpal bones are to be fused depends on the location and type of pathology. Kienböck disease (AVN of the lunate) can be treated by fusing the radial aspect of the carpus. A scaphotrapeziotrapezoidal (STT) arthrodesis stabilizes the carpus and unloads the central column of the wrist. Scapholunate dissociation resulting from rupture of the scapholunate ligament can also be treated with STT fusion. Wrist arthrodesis, either pancarpal or limited, is considered the primary surgical alternative in patients with most end-stage arthritic conditions of the wrist. The pancarpal arthrodesis is a predictable durable alternative to a variety of posttraumatic, degenerative, or neoplastic conditions of the wrist. However, some authors report that complications may be prevalent. This procedure may also be modified and applied to the destroyed rheumatoid wrist. Overall, selection of fixation mode depends on bone quality. With the current wide array of surgical alternatives, the surgeon must consider each case carefully and select the procedure that best applies to each particular situation. Furthermore, the surgeon must educate the patient on the limitations of each procedure. In a study aimed at investigating the long-term rate of secondary surgical procedures (including conversion to total wrist arthrodesis) in 123 patients who underwent proximal row carpectomy (n = 62) or four-corner arthrodesis (n = 61), Williams et al found that at a mean follow-up of 8.2 years, the two operations were comparable in terms of patient-reported outcomes and total wrist arthrodesis conversion rates. However, those in the four-corner arthrodesis group were significantly more likely to undergo secondary operations. Logan JS, Warwick D. The treatment of arthritis of the wrist. Bone Joint J. 2015 Oct. 97-B (10):1303-8. [Medline]. Watson HK, Ballet FL. The SLAC wrist: scapholunate advanced collapse pattern of degenerative arthritis. J Hand Surg Am. 1984 May. 9 (3):358-65. [Medline]. Toma CD, Machacek P, Bitzan P, Assadian O, Trieb K, Wanivenhaus A. Fusion of the wrist in rheumatoid arthritis: a clinical and functional evaluation of two surgical techniques. J Bone Joint Surg Br. 2007 Dec. 89 (12):1620-6. [Medline]. Jebson PJ, Adams BD. Wrist arthrodesis: review of current techniques. J Am Acad Orthop Surg. 2001 Jan-Feb. 9 (1):53-60. [Medline]. Wei DH, Feldon P. Total Wrist Arthrodesis: Indications and Clinical Outcomes. J Am Acad Orthop Surg. 2017 Jan. 25 (1):3-11. [Medline]. Honkanen PB, Mäkelä S, Konttinen YT, Lehto MU. Radiocarpal arthrodesis in the treatment of the rheumatoid wrist. A prospective midterm follow-up. J Hand Surg Eur Vol. 2007 Aug. 32 (4):368-76. [Medline]. Krimmer H, Wiemer P, Kalb K. [Comparative outcome assessment of the wrist joint--mediocarpal partial arthrodesis and total arthrodesis]. Handchir Mikrochir Plast Chir. 2000 Nov. 32 (6):369-74. [Medline]. Dacho A, Grundel J, Holle G, Germann G, Sauerbier M. Long-term results of midcarpal arthrodesis in the treatment of scaphoid nonunion advanced collapse (SNAC-Wrist) and scapholunate advanced collapse (SLAC-Wrist). Ann Plast Surg. 2006 Feb. 56 (2):139-44. [Medline]. Mih AD. Limited wrist fusion. Hand Clin. 1997 Nov. 13 (4):615-25. [Medline]. Watson HK. Limited wrist arthrodesis. Clin Orthop Relat Res. 1980 Jun. (149):126-36. [Medline]. Taleisnik J. Subtotal arthrodeses of the wrist joint. Clin Orthop Relat Res. 1984 Jul-Aug. (187):81-8. [Medline]. Watson HK, Weinzweig J, Guidera PM, Zeppieri J, Ashmead D. One thousand intercarpal arthrodeses. J Hand Surg Br. 1999 Jun. 24 (3):307-15. [Medline]. Gaston RG, Greenberg JA, Baltera RM, Mih A, Hastings H. Clinical outcomes of scaphoid and triquetral excision with capitolunate arthrodesis versus scaphoid excision and four-corner arthrodesis. J Hand Surg Am. 2009 Oct. 34 (8):1407-12. [Medline]. Hegazy G. Capitolunate Arthrodesis for Treatment of Scaphoid Nonunion Advanced Collapse (SNAC) Wrist Arthritis. J Hand Microsurg. 2015 Jun. 7 (1):79-86. [Medline]. Berger RA. Partial denervation of the wrist: a new approach. Tech Hand Up Extrem Surg. 1998 Mar. 2 (1):25-35. [Medline]. Clayton ML, Ferlic DC. Arthrodesis of the arthritic wrist. Clin Orthop Relat Res. 1984 Jul-Aug. (187):89-93. [Medline]. Martini AK. [Wrist joint arthrodesis. Technique and outcome]. Orthopade. 1999 Oct. 28 (10):907-12. [Medline]. Mouilhade F, Auquit-Auckbur I, Duparc F, Beccari R, Biga N, Milliez PY. Anatomical comparative study of two vascularized bone grafts for the wrist. Surg Radiol Anat. 2007 Feb. 29 (1):15-20. [Medline]. Kawamura K, Yajima H, Kobata Y, Murata K, Shigematsu K, Maegawa N, et al. Wrist arthrodesis with vascularized fibular grafting. J Reconstr Microsurg. 2009 Nov. 25 (8):501-5. [Medline]. Millender LH, Nalebuff EA. Arthrodesis of the rheumatoid wrist. An evaluation of sixty patients and a description of a different surgical technique. J Bone Joint Surg Am. 1973 Jul. 55 (5):1026-34. [Medline]. Larsson SE. Compression arthrodesis of the wrist. A consecutive series of 23 cases. Clin Orthop Relat Res. 1974 Mar-Apr. 99:146-53. [Medline]. Richterman I, Weiss AP. Wrist fusion. Hand Clin. 1997 Nov. 13 (4):681-7. [Medline]. Pham TT, Lenoir H, Coulet B, Wargny M, Lazerges C, Chammas M. Proximal row carpectomy in total arthrodesis of the rheumatoid wrist. Orthop Traumatol Surg Res. 2015 Dec. 101 (8):919-22. [Medline]. Short WH, Werner FW, Fortino MD, Palmer AK. Distribution of pressures and forces on the wrist after simulated intercarpal fusion and Kienböck's disease. J Hand Surg Am. 1992 May. 17 (3):443-9. [Medline]. Chung KC, Watt AJ, Kotsis SV. A prospective outcomes study of four-corner wrist arthrodesis using a circular limited wrist fusion plate for stage II scapholunate advanced collapse wrist deformity. Plast Reconstr Surg. 2006 Aug. 118 (2):433-42. [Medline]. El-Mowafi H, El-Hadidi M, Boghdady GW, Hasanein EY. Functional outcome of four-corner arthrodesis for treatment of grade IV scaphoid non-union. Acta Orthop Belg. 2007 Oct. 73 (5):604-11. [Medline]. Berkhout MJ, Shaw MN, Berglund LJ, An KN, Berger RA, Ritt MJ. The effect of radioscapholunate fusion on wrist movement and the subsequent effects of distal scaphoidectomy and triquetrectomy. J Hand Surg Eur Vol. 2010 Nov. 35 (9):740-5. [Medline]. Bain GI, Watts AC. The outcome of scaphoid excision and four-corner arthrodesis for advanced carpal collapse at a minimum of ten years. J Hand Surg Am. 2010 May. 35 (5):719-25. [Medline]. Solem H, Berg NJ, Finsen V. Long term results of arthrodesis of the wrist: a 6-15 year follow up of 35 patients. Scand J Plast Reconstr Surg Hand Surg. 2006. 40 (3):175-8. [Medline]. Tomaino MM, Miller RJ, Burton RI. Outcome assessment following limited wrist fusion: objective wrist scoring versus patient satisfaction. Contemp Orthop. 1994 May. 28 (5):403-10. [Medline]. Murray PM. Current status of wrist arthrodesis and wrist arthroplasty. Clin Plast Surg. 1996 Jul. 23 (3):385-94. [Medline]. Rayan GM. Wrist arthrodesis. J Hand Surg Am. 1986 May. 11 (3):356-64. [Medline]. Rahgozar P, Zhong L, Chung KC. A Comparative Analysis of Resource Utilization Between Proximal Row Carpectomy and Partial Wrist Fusion: A Population Study. J Hand Surg Am. 2017 Oct. 42 (10):773-780. [Medline]. Williams JB, Weiner H, Tyser AR. Long-Term Outcome and Secondary Operations after Proximal Row Carpectomy or Four-Corner Arthrodesis. J Wrist Surg. 2018 Feb. 7 (1):51-56. [Medline]. Terrono AL, Feldon PG, Millender LH, Nalebuff EA. Evaluation and treatment of the rheumatoid wrist. Instr Course Lect. 1996. 45:15-26. [Medline]. Shindle MK, Burton KJ, Weiland AJ, Domb BG, Wolfe SW. Complications of circular plate fixation for four-corner arthrodesis. J Hand Surg Eur Vol. 2007 Feb. 32 (1):50-3. [Medline]. Clendenin MB, Green DP. Arthrodesis of the wrist-complications and their management. J Hand Surg Am. 1981 May. 6 (3):253-7. [Medline]. Moneim MS, Pribyl CR, Garst JR. Wrist arthrodesis. Technique and functional evaluation. Clin Orthop Relat Res. 1997 Aug. (341):23-9. [Medline]. Wrist arthrodesis. Lateral wrist radiograph depicting marked wear in radiocarpal articulation. Wrist arthrodesis. Posteroanterior wrist radiograph demonstrating marked radiolunate degenerative joint disease. Either radioscapholunate fusion or total wrist fusion is appropriate treatment. Wrist arthrodesis. Radiograph of patient after wrist fusion. No distal ulnar resection was necessary in this case. Wrist arthrodesis. Lateral view following wrist fusion demonstrating dorsiflexion provided by plate. Wrist arthrodesis. Intraoperative view after plate application. Portions of distal radius and dorsal capitate have been resected to allow proper plate fitting. Wrist arthrodesis. Retinaculum split and repaired to avoid tendon attrition by plate and prevent bow-stringing. Wrist arthrodesis. 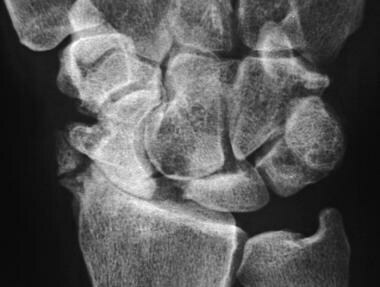 Posteroanterior radiograph of wrist following scaphoid excision and four-corner (lunate-capitate-hamate-triquetrum) fusion. Wrist arthrodesis. Lateral radiograph of four-corner arthrodesis. Wrist arthrodesis. Note well-preserved joint interval in radiolunate articulation, as well as dorsal translation of the capitate, which must be corrected during fusion. Wrist arthrodesis. Schematic emphasizing need for correct capitolunate alignment during four-corner arthrodesis. Wrist arthrodesis. Completed radioscapholunate fusion. Wrist arthrodesis. Radioscapholunate fusion technique. Wrist arthrodesis. Position of dowel grafts for scaphotrapeziotrapezoidal (STT) fusion (radial) and four-corner fusion (ulnar). Wrist arthrodesis. Side-to-side range of motion after scaphotrapeziotrapezoidal (STT) fusion.